Drugmakers are seen reporting moderate sales growth in July-September on sluggish domestic business and lack of major product launches in the United States (US) while dearer raw material and higher operational costs would contract margins. Sun Pharmaceutical is expected to buck the trend with consolidation of Taro Pharmaceutical Industries while Lupin and Glenmark Pharmaceuticals would also outperform the sector on research and royalty income. Domestic formulation business for most companies, particularly Dr Reddy’s Laboratories, Ranbaxy Laboratories and Cipla, is likely to witness high single digit growth on back of increasing competition, brokerage Pinc said in a note. “The domestic formulations business is slowing due to increasing competition from smaller unlisted firms and there has not been a major epidemic in the quarter," Sushant Dalmia, analyst at Pinc, said. The increased cost of raw materials and risen expenditure would impact EBITDA margins by about 70 basis points, he said. India’s pharmaceutical industry sees its raw materials costs rising due to an appreciation of the dollar, N.R. Munjal, president of the Indian Drug Manufacturers Association (IDMA), said last month. Rupee depreciated 9.56% against dollar in July-September. 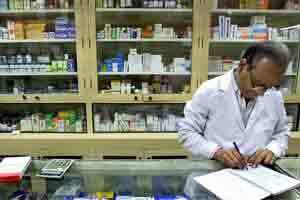 A Reuters’ poll has forecast 11-17% sales jump for six of the 10 drugmakers in September quarter while Sun Pharma, Glenmark and Aurobindo Pharma would report business growth of more than 20%. “All the firms are facing intense pricing pressures in the anti-infectives segment, which will eventually impact their domestic sales," Siddhant Khandekar, analyst at ICICI Direct, said. The anti-infectives segment contributes about 18% to the overall therapeutic sales in India, he added. “Although there are pressures, we still believe, pharma space, with mid-double digit growth, would better all other sectors," Khandekar said. Top drugmaker Ranbaxy, majority owned by Japan’s Daiichi Sankyo, would see revenue rising 10% in base business, brokerage Edelweiss said in a note. Biotechnology firm Biocon is seen reporting a dip in September quarter net profit, while sales would plunge substantially, the Reuters’ poll shows. “We expect Biocon sales to decline by 23% due to divestment in AxiCorp but the margins would improve," ICICI Direct said. The drugmaker decided to sell stake in Germany’s Axicorp as part of its focus on global alliances that would include Germany and did not require the company to have a separate unit for the region. Country’s number two drugmaker by sales Dr Reddy’s Labs would see sales growth driven by US product launches and generic Arixtra, an anti-coagulant, will contribute $6 million to July-September sales, Pinc said.